This is the book I picked up at the Book Vending Machine in Singapore (I wish I could insert a picture of the Vending Machine here, but I can't seem to find my SD-card atm - so maybe I will do that later). But back to the book: I freaking loved it! 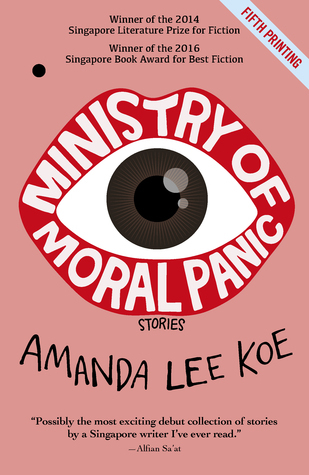 I was never a big fan of short stories but this collection of Amanda Lee Koe is just so freaking perfect. She writes about seemingly normal people, living in Singapore, but every single one of their lives can teach us, the readers, something! There is an artist trying to show, how money can buy you everything, even the pride of a person, a girl falling in love with an exchange student from America, a woman willing to do everything to keep up her fassade of a perfect extraordinary love story, a psychopath searching for her place in the world, a lesbian couple, a son of a Siren and an urban anthropologist, who gives the people hope, just to destroy it late. I can't even gather the words to describe Amanda Lee Koe's extraordinary writing, the pictures I have in my head and the things I have learned through her stories. Just go, and read this book!! !